Twitter’s currently testing a new feature that could well prove popular with users following thousands of people. Called ‘Fave People’, it allows you to easily build a separate timeline for your favorite Twitter users. The Fave People timeline would sit alongside Discover and Activity, offering you speedy access to your favorite users with no more than a couple of swipes. Building your Fave People timeline is simple enough – just tap on the star icon in the profile of the user you want to add. 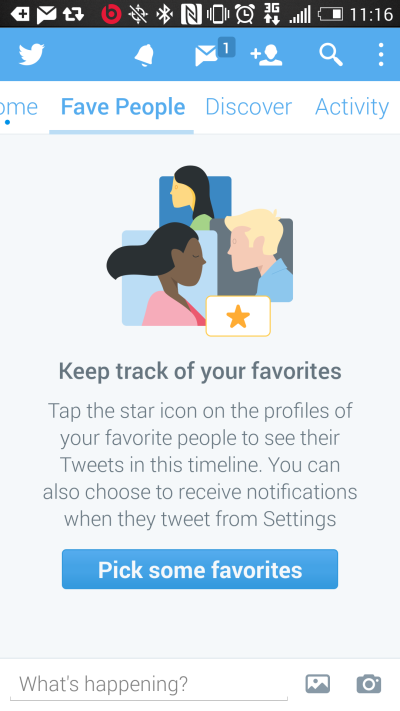 It’s also possible to choose to receive notifications every time someone in your Fave People timeline tweets. Of course, it’s currently possible to use Twitter’s Lists feature to gather together your top users, but Twitter imagines such a Fave People list is one many users would like to create, and consequently is looking for a simple way to build the list and give users speedy access to the resulting timeline. The feature is currently showing up in the alpha version of the Twitter app – this is the special Android version of Twitter where new ideas get tried out before making their away to beta testers. Once Fave People has been refined and fully tested – and if it proves popular with beta testers – we can expect to see it rolled out to all users before too long. However, should the testers give it the thumbs down, we’ll likely never hear of Fave People again. Is it the kind of feature you’d like to see on Twitter?